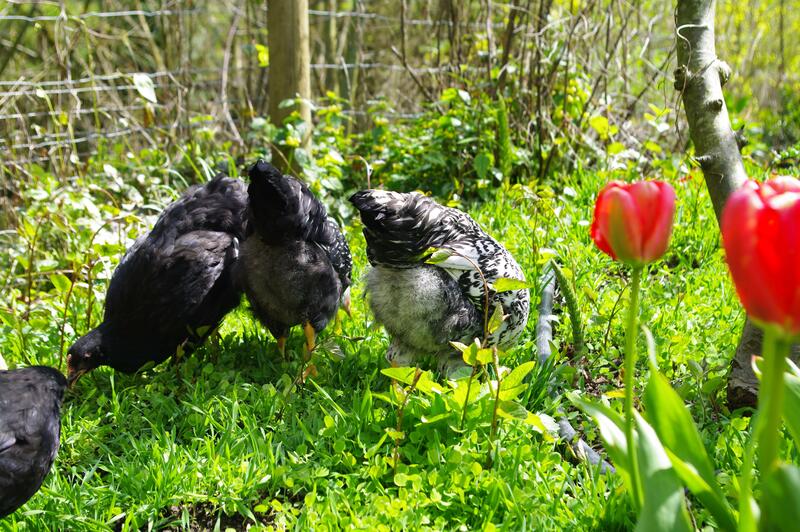 Composting Chicken Manure: Watch the Heat! My compost pile is cooking! One of the biggest reasons I wanted chickens was not for the eggs, but for the manure. We (or rather our poor clay fill soil) can use a lot of compost, and last year I didn’t get the volume that I wanted. Chicken manure and pine shavings, here we come! In fact, I’ve even decided not to use the deep litter method for the chickens (where you keep topping up the pine shavings and only clean out the coop once or twice a year) because I want the volume in my compost. I’ve been suspicious about how long it might take to break down the pine shavings, though, as wood is very high in carbon and is usually the last thing in the compost pile to disappear. In fact, in the compost I made last season, the straw (which has much less carbon than wood) is still mostly intact, even though everything else has long since become brown and crumbly. To break down materials high in carbon, of course, you need a fair bit of nitrogen, which is why the chicken manure is a good match. But I had no idea, really, what a good balance would be. So I just waited until the shavings looked pretty saturated with poop, and then cleaned out the coop. But to mitigate the high carbon of the shavings, I thought I’d better really soak my chicken litter as I piled it into the compost bin. Then I thought to really help things along, I would add another big nitrogen source. I scoped out the local coffeeroaster and picked up a garbage bag full of coffee grounds, and mixed that in too. The next day, the compost heap stunk to high heaven! I thought I’d better turn the pile a bit. When I did, steam started immediately rising out of the heap and my eyes started to water. What I was smelling was ammonia–the pile was getting so hot that the nitrogen was burning off as ammonia gas! Not good. Not only is the ammonia not exactly healthy, but the idea behind adding manure and/or compost to the garden is to increase the available nitrogen in the soil, and burning all the nitrogen in the composting process rather defeats the purpose. So, we added leaves, shredded paper, and some coffee chaff, and turned the pile again. The next day, the smell was still pretty potent, so we repeated the process. By that time, some of the kitchen waste that we’d mixed in the original pile had literally been turned to ash. But the smell was waning, and the moisture content seemed to be levelling off. Success! At this rate, we should have a few amazing cubic yards of compost for the garden in just a few months. Look out clay soil, organic matter is coming your way! The latest long-term weather prediction that I heard yesterday was for a warmer than usual summer everywhere in the country except perhaps Vancouver. Here’s hoping we’re included in the heat! Come ooonnnnn Tomatoes!! On the other hand, this has been a much colder than normal spring. Farms around here are announcing that they are 3 weeks behind schedule, and that veggie sales won’t start in earnest until June. Bottom line: in food production, weather trumps everything, and our weather is more unpredictable than it used to be. (I read a great British garden book last year where the gardener told newbies not to be afraid, because in a good weather year, even the worst gardeners can’t go wrong, and in a bad weather year, even the master gardeners can’t do well!) So what to do? We are prioritizing more and more our food security, and the weather isn’t making those steps easy. I’ve noticed, though, that those best equipped to deal with unpredictable weather are home gardeners. By virtue of being smaller and therefore more carefully tended, the home gardener has all kinds of options for mitigating weather issues that the farmer simply doesn’t have the time or money to put into place. This week, a local farmer was writing about last year’s tomato harvest–they had lost hundreds of pounds of tomatoes (and consequent income) in those same late summer rains last year. I can’t imagine what it must have felt like to watch those plants nurtured from seed rotting in the fields. When the rains started threatening here, I panicked about blight and ripening, and the Skipper promptly rigged up poly covers for all the tomato beds. Despite a lousy tomato year, we still had lots to eat through November, and we’re still eating our way through our home-canned jars. On the other hand, I wonder sometimes about how we home gardeners are really adapting to this uncertain weather. Laura, over at the Modern Victory Garden, has pacific northwest vegetable production down to a science. She recently blogged about her tomato process, influenced by her very short growing season. She starts pretty much everything “ultra early” under grow lights inside–tomatoes in January!–and then plants out as the weather allows. As a result, she gets unbelievable production out of a modestly-sized and modestly sunny space. I’m learning from her experience–and those of many others–but I have this niggling worry about whether this kind of self-sufficiency really equals resiliency. There seems to be a paradox for me that in order to produce the foods we want to eat in the climate we’re living in, we need to use high levels of technology and a lot of plastic: row covers, greenhouse film (plastic hoophouse covers), plastic heat-reflecting “mulch”, heat cables and mats, grow lights, pvc pipe or metal conduit, plastic irrigation tubing, drip tape, timers… Clearly few of these technological advantages will be ours in a low-carbon future. Now, just because we won’t have these things down the road, does that mean we shouldn’t use them now? I’m not sure. I’ve tried to stay fairly low tech. I don’t use grow lights, and I’m learning to use the unheated glass greenhouse that I inherited on the property. I’ve switched to soil blockers from plastic cell packs, which is wonderful, but, in fact the cell packs were all recycled anyway. But I did use a heat cable in a sand-covered tray this year, rather than starting all my seeds in the house (we don’t have a great south-facing window space for setting up everything I’m starting) that’s already being kept warm. And then there’s the reality of the technological advantage! Last year we bought a Costco-sized bolt of row-cover fabric that we never used. A few weeks back I was transplanting out lettuce, spinach, etc, and decided to try a row-covered hoop-house over one of the beds. The difference in size and maturity between those planted in that hoop-house and those not is amazing! Yet again, I was ready to cover the whole raised bed section of our garden in a giant greenhouse! When I start talking to the Skipper about germination temperatures and days to maturity and minimal night temperatures and nutrient balances, his eyes start to glaze over. He shakes his head at me and says, “we just used to put seeds in the ground!” He thinks I’m way over-complicating things! And remember, this is from someone who grew up in a very short growing season, one complete with “Fogust”. His mom’s rural garden in the 60s and 70s would have been pretty low tech. They started seeds in the window. They mulched with seaweed and buried their seafood shells. Whatever they grew in that short summer season supplemented a pretty simple staple diet of fish and potatoes. And his mom grew up down the road in what would have been a pretty self-sufficient world by necessity–they were pretty remote, and had lived pretty much the same way for several generations. They raised some sheep and used the fleece for wool clothing. They used horses for their woodlots and other heavy lifting. They fished for themselves and for some cash, and did a huge variety of other things for themselves and for the income they needed for those things they couldn’t provide on their own. And generally–except for the smoking!–they lived pretty long and healthy lives. I’m sure many of us have similar stories in our family history–we all do, I guess, if you go back far enough. What’s not in the Skipper’s story and memory, though, is all the local knowledge that would have allowed them to live like this. He remembers a lot, but mostly about the things he cared about: fishing, his uncle’s mill, anything with a motor, using the horse in the forest. But all the knowledge that I suspect went into his mother’s garden? I think that’s where “we just put seeds in the ground” comes in! I’ll have to ask her on this visit! When to plant what, what crops not to bother with, did they save seeds, what to start early and what to direct sow, what grew well, did they cover anything, etc, etc. I suspect there was a little more going on than the busy boy remembers! So if the low-carbon past is also our future, and if we need to produce as much as we can because of industrial food insecurity, where does that leave all of this high-carbon technology? Well, personally, I’m not boycotting it just yet. As a new gardener, I need to gain experience and knowledge, and using technology is helping me to understand important relationships between plants and temperature, pests, days to maturity, and more. If I didn’t use any fossil-fuels right now, I’d be pretty limited in what and when I could grow. I could experiment with varieties, and I could use my south-facing window as best I could. I could try to create micro-climates outside through permaculture design instead of with plastic (which I should be doing anyway!). But the technology is allowing me to really understand the difference that warmer night temperatures and soil temperatures make. And my hope is that understanding that principle means that when I can’t justify using the fossil-fuels, I will get creative with manure and water sinks and all the other ways that might be available to get the same effect with less technology. Of course, Sharon Astyk writes convincingly that right now we should “Do it Anyway”; that we should be trying to live “as if” the low-carbon future was here. We have flexibility, we can still go to the store. We should learn to garden the resilient way while we can afford to make mistakes–before our survival depends on it. So what do you think? Are we fooling ourselves that we can produce food in abundance as long as we’re relying on fossil-fuel technology? Or is the technology a tool to build security and knowledge in the short-term? Are you taking advantage of the scale of the home garden to do mitigate things that farmers couldn’t? For a few comments on the Canadian Federal Election results that came in last night. Like everyone else in the country this morning, I’m waking up to a very different government than I expected to have even a few weeks ago. There’s much to celebrate, and also much to fear; it’s a weird feeling, and the whole country’s going to have to take a little breather, I think, to get used to this very new look and feel in our Parliament. For those who weren’t paying close attention, here’s what happened. For the last number of years, we’ve had a Conservative minority government, with 3 other parties making up the balance: the Liberals (Canada’s oldest political party, usually centre-left, and often called the “natural governing party”), the NDP (a European-style social democrat party that is a perennial 3rd, but is beloved for having brought universal healthcare to Canada), and the Bloc Quebecois (the Quebec seperatists that has held Quebec for 20 years, which has so many seats that the BQ has held the Official Opposition role before, but that can never form government because they only run candidates in Quebec). The minority government means that to pass any legislation, at least one other party has to vote with the government, otherwise, the government doesn’t have enough seats. This often leads to co-operative governments, but in the last number of years, it’s led to a lot of posturing and squabbling. Very creepily, it’s also led to the Conservative party to ignore a lot of the rules and conventions of parliament. In fact, the Conservatives were so deceptive and rude that we had this election because the rest of the parties ended up finding the Conservatives in contempt of parliament–the first time in history that rule has been invoked. Despite the circumstances, though, pretty much everyone was predicting that we’d end up after the election with basically the same government that had just been dissolved. And until a couple of weeks ago (we have 6 week election campagins), that looked like a pretty safe bet. But that’s not what we’re waking up to. Instead, the Conservative’s “give us a majority government or doom will come to us all” campaign seems to have worked, and they won a substantial majority last night. On the other hand, the NDP’s relentlessly positive campaign of practicality, working together, and platform policies of supportive and caring government also seems to have worked. The NDP more than doubled their record number of seats and have formed the Opposition! It’s hard to overstate what a transformation that is. The Green party also had an amazing, exciting breakthrough and their leader won the Green’s first seat ever! And the NDP’s gain came at the expense of the BQ, which is down to around 3 seats (haven’t checked the final numbers), and is basically eradicated as a party. The Liberals have been pummeled; some are wondering if they will ever return. I have been accused of being a relentlessly positive person (mostly by my more pessimistic husband 🙂 ). And I am. But I don’t base my optimism on rose-colored glasses or willful ignorance of reality. The Conservatives now have almost unfettered power, and this is very scary to me. I am ideologically opposed to them in almost every way, including the fact that they are very ideologically driven, which I find scary in and of itself. I think it’s pretty clear that I will vehemently disagree with the direction the government takes for the next 4 years. I expect to be disgusted and sad and worried. But. This is not the end of the world or of the country as we know it. Canada, along with every other democracy in the world, goes through political cycles of left and right and sometimes other, and Canadians have had Conservative governments many times in our history. Living in a democracy still means that the people have a lot of power. And it is our collective culture that determines who we are on the ground, not our government alone. Just because this government will do less than nothing about climate change adaptation or prevention, for instance, doesn’t mean that Canada does nothing. We are all going to continue to do the work that we feel is important, and continue to move issues forward that we feel need to be addressed. And, the NDP and Greens (and the Liberals, too, though I don’t really care as much about what happens to them) now have 4 years to gain support, to work on their policies, and for the public to get more comfortable with them. Because sometimes the universe is just biding time. Would Obama (whatever you think of him) ever have been elected if George W hadn’t had 8 years to really show the country and the world what he was made of? More than anything, I love it when the will of the people is strong and unpredictable. My favorite move in curling is when someone throws a rock that completely clears the ice and everyone gets to start again. I love it when all the rules change and we have to throw out all the ways we used to think and reconsider all our options. That’s what Canada looks like to me this morning–scary and hopeful all at the same time. As I mentioned a few days ago, I have an addiction to the idea that moving house solves all problems. I have fought this most noticeably since we bought our first home almost 2 years ago. We LOVE it here. There really is no reason I should be doing anything but basking in that feeling. And I do. But yet. Then we did our taxes a couple of weeks ago. We’re always a little shocked at what our combined incomes amount to. We spent so many years with me as a full-time student, working part-time, and even though I now work full-time, my job is not secure, and I still spend part of the year (usually a month or so during the summer) on EI. So we don’t exactly feel like we have 2 substantial incomes. But it adds up, nonetheless, and at the end of the last 2 years, we’ve been quite startled to see by how much. Which always begs the question, where the heck is all the money going?! It certainly isn’t piling up in the savings account! We spent a number of years concentrated on paying off debt and tracking our expenses quite carefully, but we’ve eased off in recent years. I still keep mental notes, though, and, truly, I do know where the money goes. The mortgage, insurance of all kinds, commuting car, maintenance, and fuel costs, higher (than a condo or apartment) utilities, and right now, into the garden. Building supplies, fencing supplies, irrigation, topsoil, mulch….infrastructure that feels well worth it. So I had a moment in the midst of all this money reflection where I thought, maybe it’s time to move to Nova Scotia. We are a bi-coastal family. Most of my family is on the west coast, most of the Skipper’s is on the east coast. The Maritime provinces are stunningly beautiful, and they are SUBSTANTIALLY cheaper–at least in property prices–than here in the west. We used to spend our trips there driving around the province, real estate booklets in hand, oohing and aahing over heritage homes on large, picturesque acreages, priced at less than $100K. We never did the big move for a whole variety of reasons, but it remains in our minds as a phantom possibility. And every once in a while, the possibility starts to look appealing again. How different would our lives be, how much less income would we need to earn if our mortgage was less than a third of what it is now? It’s a staggering thought in weak moments. We conveniently forget the costs of renovating one of those century-old homes, the costs of heating oil through the winter. Hard to say how that might impact the overall picture. Perhaps it’s no coincidence, then, that last night I was reading Sharon Astyk’s chapter in Depletion and Abundance on “Home Economics and Home-Land Security.” In it, she takes a realistic look at what our homes are going to need to do for us in a low-carbon, less stable future. And she asks readers to consider the option of moving if necessary. Perhaps you live in a home you can’t afford, or in a location that isn’t working for you. Perhaps you are far away from family or other support systems. Perhaps the climate change projections for your area are dire: underwater, say, or desert (Palm Springs?). On the other hand, she also asks us to consider the option of staying put. If you are currently in a home that you can afford, that allows you to grow some food or has other flexible assets (rooms you might rent out or bring family into, a garage that could be a business space, a good community location, etc), then keep it. Don’t go chasing the dream of the perfect, sustainable house. Don’t build a new house. Improve the one you’re in and hold on to your family asset. Reading all of this was a helpful reminder of all the reasons why we bought this house to begin with, which includes many aspects that could serve us well should the future look dramatically different. 1. Location, location, location. There is often a trade-off with more rural living, and that trade-off is the car. Rural life is often completely car-dependent, and that doesn’t look particularly stable in a low-energy future. However, our house is within walking distance of a lovely village with some basic shops and services. It’s within walking distance of the marina where our sailboat (potentially a useful transportation and food gathering tool) is moored. We are within an easy 2.5K bike ride to the large suburban shopping plaza that has a grocery store, pharmacy, restaurants, etc. We are within about 10K–also an easy biking distance, though not so much fun along the highway at the moment–to a small city with many central services for the wider community, including a large and thriving farmer’s market. We are also located on a reasonably trafficked road, which in some ways is a downside, but if/when we wanted to start any home business, becomes a big plus. In fact, we’re the only home for a few hundred meters that has a pull-out space from the road, which makes drive-by business entirely feasible. In the wider community, the picture is also bright. The culture here is very focused on sustainability and food security. There is an active Transition Town movement, among many other groups. There is growing political will to revive the old rail line that used to be the essential commercial and personal link up and and down the Island, and this would mean that larger centres–including the two that Skipper and I work in at the moment–could be accessible after a short bike to the local train station. In fact, there’s even a local livestock feed producer who still uses that rail line to gather feed supplies from the island and blend it here. When I really think about it, there are not many other places where there is so much potential so close by, and with minimal transition required. 2. Neighbours. Our neighbours are great. A family as dedicated to growing their own food moved in next door to us, and we have provided mutual support already. On the other side are also friendly folks who have a small, sunny acreage that they keep as simple pasture/meadow that they mow (but no chemical lawn). There are numerous and diverse farms close by and all of the above groups are there for us to become involved with. There is an elementary school a few blocks away which is a vital community centre (including our polling booth for today’s federal election!). 3. Size. We loved this house and property because it was a great size and layout for two adults without children. There is lots of space for guests or boarders, and we could easily build in a suite if we needed to. But right now this also means that there is lots of storage space and prep space for food and other livelihood production. The property isn’t big enough to farm commercially (I don’t think, but that’s another post), but it is certainly big enough to provide most of our food and some surplus veggies, etc. With the other community and neighbourhood resources, there’s also no reason for us to need to provide all of our staples on our own property. With no children to change our needs over time, it’s also likely that this house could work for us for the rest of our days. We could easily live entirely on the main floor if mobility became an issue, and other spaces could be used by caregivers and/or garden helpers (or both in one!). We live right on a fairly main road, which makes accessibility easy. 4. Reasonable energy independence. Few homes not specifically built to be energy independent are going to be perfect in this regard, clearly. But ours has some definite advantages. It was custom built, rather than a generic spec house. This means that some basic function were really intelligently considered. There is a good south-facing wall for lots of light and passive solar heat gain. Cleverly, the house layout also means that these warmer, brighter rooms are also the main living spaces. The open layout also means that once we get the woodstove in, it will easily heat the main living areas, and with some minor (according to the Skipper!) tweaking, we can use the existing duct-work to blow some of the heat downstairs. The house and windows are well-insulated, the rooms reasonably sized, the layout efficient. Our climate is not extreme–even with no heat, inside would rarely drop below freezing. Wood (waste wood in particular) is easily available on this forested island. We also have the space and plans for an outdoor wood oven or rocket stove, and lastly, we have good south-facing roof space for solar panels, if we ever wanted to go that way. 5. Water. Water is a mixed bag here. Presently, it’s a bit of a weak point that we would need to address. We’re on a well to an aquifer, and luckily it’s a good one, not too far down (unlike many in these parts!). The water quality is very good, though we do use a softener to deal with iron (but I think that’s more cosmetic–if we couldn’t run the softener, I think we’d just be like many people in the world that deal with water that tastes a little odd and causes scale build-up. Inconvenient, but how most used to live and many still do). The down side is that the pump for the well draws a LOT of power. Not constantly, but when it fills up the tank, it draws around 4000W! This winter, we bought a generator, and it was a big decision whether to get one with enough power to work the well. For a few days without power, we could buy drinking water, there would be some stored in the tank, and we would just cope with not bathing much or flushing toilets. But in the end, we went with one big enough to be able to re-fill the tank if necessary. Down the road, this is something we should continue to work on. A more efficient pump, a manual or solar option would be worth putting in. We do no rainwater collection right now, and that could add a lot to our irrigation ability. Our aquifer is great, but aquifers are mysterious. We don’t know if the farm across the street, or the new subdivision down the road are drawing on the same one, or how big or deep or secure it is. We have installed low-flush toilets and low-flow showerheads and micro-irrigation. We could install a greywater system from the kitchen to the garden fairly easily. But in this climate, we have summer drought, and climate change may be expanding that drought period, even as it makes our springs cooler and our growing season shorter. 6. Sewage. Here too, it’s a bit of a mixed bag. Most rural properties have septic systems, and though these take up a lot of space, they are usually simple, last a long time (with an occasional pumping), and use gravity to power them. We’re a little different. The good news is we have an actual sewage treatment “plant” on our property. With some bacteria and enzymes, our sewage is broken down in a series of small tanks and when it’s done, pure water comes out. Cool! The down side is that it’s location limits our growing area, and the process does draw some power. Not a lot, though, I don’t think; we should look into solar options for that. And, truly, there is lots of space on the property for an outhouse or composting toilet if it came to that. To conclude this epically long post (!) then, let me say that I think I may have kicked my real estate habit. At least for now!. If I can make the psychological shift, I think we are in an extremely fortunate position. The shift is two-fold: consider the mortgage something to be paid off and continue to invest in good neighborhood relationships. So traditionally taken for granted, and so radical today! But both of these are doable if we focus on them and stop the mental background noise that tells us that a home is something to flip and “move up the ladder” with, and neighbors are there for pleasantries, but there’s no point in really getting to know them when we’ll be moving in a couple of years. Whew! Well, there’s my exercise in apocalyptic preparedness! How does your home resource stack up, do you think? Well we’ve misplaced our easy, point and shoot camera, so no quick pics of the cold frame and all the seedlings that I’ve transplanted. 😦 Suffice it to say, the onions, leeks and brassicas are in! And the warmer temperatures, finally, mean that the garden is exploding into bloom. Thank goodness weeds are green! Skipper did get our mini-orchard area fenced off yesterday, which meant we could let the chickens into their new forage area. It was fabulous! And they looked so beautiful among the flowers in the bright sunshine. So with the high-tech camera, Skipper got a few stunning shots. 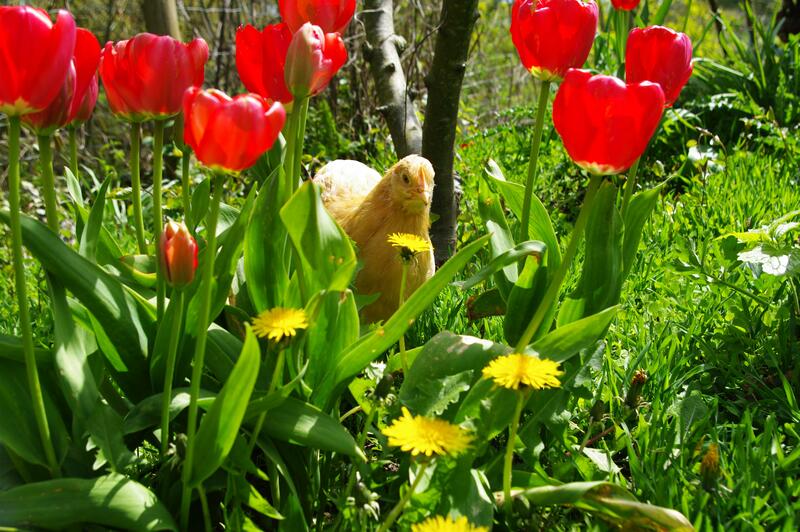 And before I get any panicked comments, I know the chickens will tear up the flower garden. This is an overgrown perennial flower garden that we would like to transition into forage/meadow/orchard. First step: let the chickens tear it up! Weed (bonus points if you can spot the morning glory/bindweed in the pics below), scratch, fertilize…We will eventually dig up anything we want to save, and we will then replant grazing forage for them. At least that’s the plan! 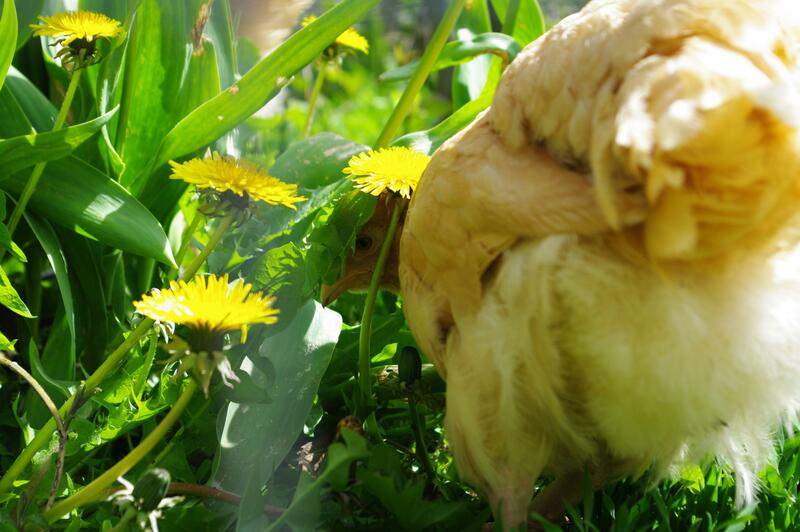 In the meantime, at least we have happy chickens!